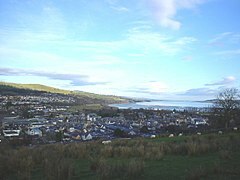 Dingwal (Inglis: Dingwall, Scots Gaelic: Inbhir Pheofharain) is a toun an umwhile ryal burgh in the Hieland cooncil aurie o Scotland. Dingwal railwey station is on the Kyle of Lochalsh line an the Far North Line. ↑ "Ainmean-Àite na h-Alba ~ Gaelic Place-Names of Scotland". Gaelicplacenames.org. Retrieved 2012-10-10. This page wis last eeditit on 5 Mey 2018, at 10:35.